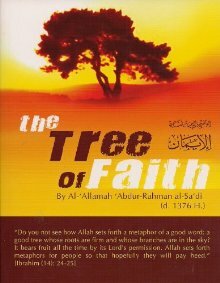 This tree varies greatly in the hearts of the believers, changing in accordance to the variation of the qualities that Allah has described it with. Therefore it is upon the servant to hasten towards acquiring knowledge about it, its descriptions, that which leads to its existence and potency, its roots and its branches. It is upon him to expend his efforts in actualizing this tree in terms of knowledge and action for indeed his portion of goodness and success, happiness in this life and the Hereafter, is dependant upon the extent to which this tree [is implanted in his heart]. « Is teaching at the Haram an automatic tazkiyyah for one’s Salafiyyah?